Last night I did a conference call with some folks in one of the eleven states who do not have a CASE affiliate. The main question they asked was what was the advantage of being affiliated with CASE? How would you answer that question? I told them there were many advantages but my top four were: the collective and respected national/international voice; the networking with colleagues from other states and provinces; the national/international resources CASE provides through our collaborations/relationships/partnerships with other national/international associations; the respect and relationship we have with governmental agencies/departments/branches. The state and provincial organizations can typically meet the needs within their state/provincial borders but there are so many resources and issues that are beyond your own borders. CASE can assist with broadening your perspective, expanding your knowledge base, magnifying your voice, and connecting you to resources! Another area where CASE provides a member service that the state and provinces don’t is the deep view CASE does on products and product research through our endorsement process. Of course we do great professional development as do so many of our subdivisions but the interaction you get at a CASE event goes across state and national lines. Our JSEL and our In CASE Newsletter again gives you so much more than what a subdivision alone can provide. Together we can be a very strong partner! And speaking of together ... Not only is the partnership between your subdivision and CASE a benefit to you and your work but also the partnership between CASE and CEC can be a powerful resource for you as you work with your staff and parents! With the new CEC tiered membership options, there is really no excuse not to be a CEC member and therefore be eligible for CASE membership! Did you realize you can now be a member of CEC($65) and CASE ($60) for as little as $125? That is being a member of CEC at the basic membership level with most of the CEC materials in the electronic format. If you are supervising special education teachers, then you need the great resources of CEC! The District membership is probably the best value with you receiving 1 premier membership which includes the CASE members and then 5 basic memberships for your teachers or other staff, but wait, you also get an additional 3 webinars-free(for a total of 5 since the Premier membership include 2 free webinars), 2 convention registrations, and all of this for just $1300! To get additional information and to join go to www.cec.sped.org/membership. Speaking of partnerships ... The Governmental Accounting Office has asked CASE to assist them with gathering information for Congressional leaders on the additional paperwork and administrative regulations from IDEA. We are thrilled there will be three (3) representatives from GAO to work with our Board of Directors (November 12-13) and to hold 3 focus groups at our 25th Annual fall conference in San Antonio on Nov. 13-15! Last week, the polling question was about paperwork. 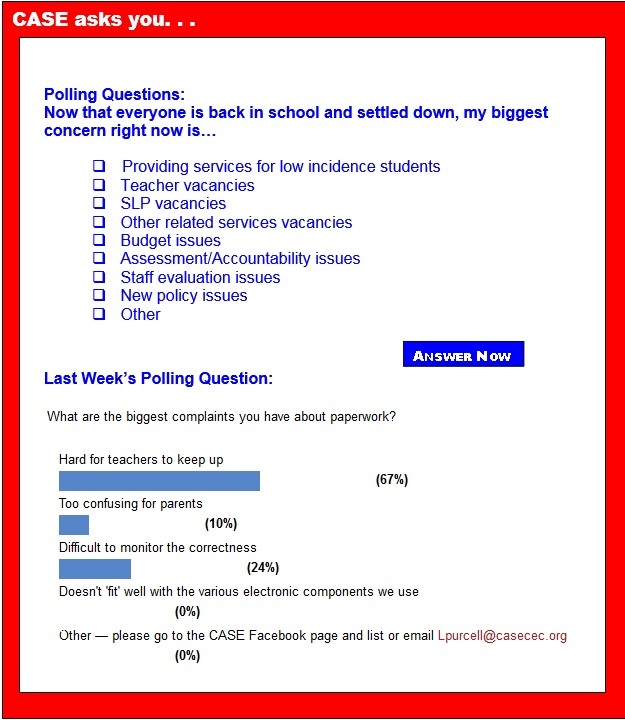 According to those who answered the poll, 67 percent said the biggest problem was how hard it was for teachers to keep up. Coming in at almost a quarter of the answers, the second biggest problem was the difficulty in monitoring the correctness of the paperwork. A distant third was with 10 percent of the respondents saying the paperwork was too confusing for parents. Do you agree? Do you have any solutions to these problems? If you can't get to San Antonio, please send your suggestions/solutions to me at lpurcell@casecec.org. Still haven't registered for the 25th Annual CASE Fall Conference? Well, there is still time! We have an overflow hotel, The Emily Morgan (a Hilton property), honoring our $139 rate but those rooms are going fast too! There are over 42 different states and provinces registered for the conference — what a great opportunity to network with your colleagues. Professional Development Chair Will Gordillo has put together an amazing program for our CASE members for the 25th Annual CASE fall conference! Our three keynotes will definitely inspire you but they also will provide you with a wealth of practical tools you can use in your everyday work ASAP. Drs. Stevan Kukic, Randy Sprick, and Frances Stetson will totally blow you away with the quality of their presentations! I have heard each of these 3 professionals on many occasions and I have always left with new ideas, new tools and a feeling that the job I do is important and necessary! The 30+ breakout sessions are also full of practical, evidenced based information. Click here for a list of the breakout sessions. If you want to learn what's new, connect with your colleagues from around the U.S. and Canada, and experience some quality professional learning that is both inspirational and content laden, then join us in San Antonio on Nov. 13-15! Registration is up at www.casecec.org. Take advantage of this excellent opportunity to serve your professional organization in a significant way! Participating in a leadership role is a challenging and rewarding experience and a great way to share your expertise, connect with other leaders and collaborate on the issues facing the field and your professional association. As part of National Bullying Prevention Awareness Month, the U.S. Education Department's Office for Civil Rights issued guidance to schools reminding them that bullying is wrong and must not be tolerated – including against America's 6.5 million students with disabilities. The Department issued guidance in the form of a letter to educators detailing public schools' responsibilities under Section 504 of the Rehabilitation Act and Title II of Americans with Disabilities Act regarding the bullying of students with disabilities. Educators can use the National Assessment of Educational Progress data backpack tools to better understand student performance on the test and make informed decisions that improve student achievement. The data backpack helps educators identify NAEP's proficient level of achievement and see how their state or district performance compares to the rest of the nation. In the typical special education scenario, the special education team sets the goals for the student receiving an Individual Education Plan. However, at the age of 14 the student reaches the age of transition and begins to collaborate with the special education team to plan goals for his future. The law intends that students can be involved with any transition decisions before age 14, which may include discussion of student goals and accommodations needed to be successful in school. But it is rare that a student attend his own IEP meeting before age 14. The teacher-student relationship impacts every aspect of the educational experience. When students don't feel safe, respected, or truly known by their teacher, they are less likely to invest and engage in their education. Conversely, when teachers feel distanced from or distrusted by their students, it's nearly impossible to muster the enthusiasm to walk into the classroom each day, let alone instill motivation or investment in our students. Phrases like "random acts of kindness" and "pay it forward" have become popular terms in modern society. Perhaps this could be best explained by those who have identified a deficiency in their lives that can only be fulfilled by altruism. It seems that we just can't get enough of those addictive, feel-good emotions — and with good reason. Scientific studies prove that kindness has many physical, emotional, and mental health benefits. And children need a healthy dose of the warm-and-fuzzies to thrive as healthy, happy, well-rounded individuals. For more than a decade, teachers, administrators, students and even parents have criticized the No Child Left Behind Act — and, now, the Obama administration's waivers under that law — for giving too much weight to standardized testing and forcing students to take too many exams. That critique hasn't gotten very far in Washington. But there are signs that the movement to limit the number of federally mandated tests students take may be gaining momentum — and it could pick up more steam as the Obama administration draws to a close and the 2016 presidential election begins in earnest. As part of National Bullying Prevention Awareness Month, the U.S. Education Department's Office for Civil Rights issued guidance to schools reminding them that bullying is wrong and must not be tolerated—including against America's 6.5 million students with disabilities. The Department issued guidance in the form of a letter to educators detailing public schools' responsibilities under Section 504 of the Rehabilitation Act and Title II of Americans with Disabilities Act regarding the bullying of students with disabilities. If a student with a disability is being bullied, federal law requires schools to take immediate and appropriate action to investigate the issue and, as necessary, take steps to stop the bullying and prevent it from recurring. Despite incremental increases in state support for K-12 education, funding levels still trail those before the Great Recession in 2007, according to a report released Thursday by the Center on Budget and Policy Priorities. Overall, 30 of the 47 states analyzed are providing less per-pupil funding for K-12 schools this school year than they did before the recession. In 14 of the states, funding has been cut by more than 10 percent, the report says. In addition to the slow recovery of funding, at least 20 states cut their support for K-12 education compared to last year, the report found. As the outcry against the overtesting of American children has grown, state and local education leaders — in a move endorsed by President Barack Obama — have announced a new focus on dialing back the volume of standardized testing and dialing up the quality. A reading interventionist might be a district’s best friend. Lake Orion Community Schools in Michigan broke new ground two years ago with its Kindergarten Reading Early Intervention Program. The unique initiative pairs full-time reading interventionists with teachers in Lake Orion's 24 kindergarten classrooms to boost the early literacy of the district's youngest students. "Our educators are encouraged to think outside of the box to enhance student achievement," Superintendent Marion Ginopolis says. As schools narrow their focus on improving performance on math and reading standardized tests, they have greater difficulty justifying taking students out of the classroom for experiences that are not related to improving those test scores. Schools are either attending fewer field trips or shifting toward field trips to places they know students already enjoy. When testing is over, schools are often inclined to take students on "reward" field trips to places like amusement parks, bowling alleys, and movie theaters. Which are the most educated cities in the US — and why? As education policies are being reviewed across the country, a recent survey shows us the most educated cities in the U.S. and their not-so-fortunate counterparts. It presents a clear picture of which states and schools districts have been more focused and whose efforts have paid off. The final picture depicts Ann Arbor, home of University of Michigan, to be the winner. The survey has acted as a wake-up call for many cities and school districts.